Do you have something to say about YoWindow? Please register on our forum - it is easy. Your questions, suggestions and reports are welcome! Usually we answer within 24 hours. Having a problem with the weather or time display in YoWindow? You will find the answer in the Troubleshooting section. Please, add more weather providers! Where YoWindow takes the CURRENT weather from? Where YoWindow takes the weather FORECAST from? Can I change the current weather station for my place? How do I find the closest current weather stations to my place? How does YoWindow choose the season? What is the difference between free and paid versions? Why YoWindow Live Wallpaper disappears after I reboot my Android? How can I remove the message displayed over the YoWindow Wallpaper? 'Plugin Blocked' message instead of beautiful YoWindow landscape. How do I fix this? Where may I find YoWindow Landscapes? How to install YoWindow Landscape? Can I create YoWindow landscape from my picture? Where can I find FREE images for YoWindow Landscape? How can I add YoWindow widget to Blogger? Give me the list of the widget parameters! How to load my landscape inside the widget? blogspot.com Why my weather widget does not reflect settings (language or temperature units, etc)? How can I connect YoWindow to my PWS? How can I connect YoWindow-widget to my PWS? My station model is not supported, what should I do? "Weather expired". Why? How to get rid of this message? When I'm trying to choose my location I see "Network error..."
YoWindow logo is too big. How can I make it smaller? Why the landscape is covered with snow? Why there are no snow on the ground? I don't see temperature in the system tray (beside the clock). The time is displayed wrong for my place. When I click on a button or the menu it does not respond. Why? Мы хотим добавить как можно больше источников погоды в YoWindow. Большинство погодных служб продают погодные данные разработчикам приложений. Обычно, погодные данные не бесплатны. Например, Weather Undeground просит $200 в месяц за 100,000 запросов в день. В данный момент, пользователи YoWindow запрашивают текущую погоду более, чем 5,000,000 раз в день. Мы физически не можем платить такие суммы. Мы открыты для сотрудничества с погодными службами. Мы будем рады добавить ваши погодные данные в YoWindow! 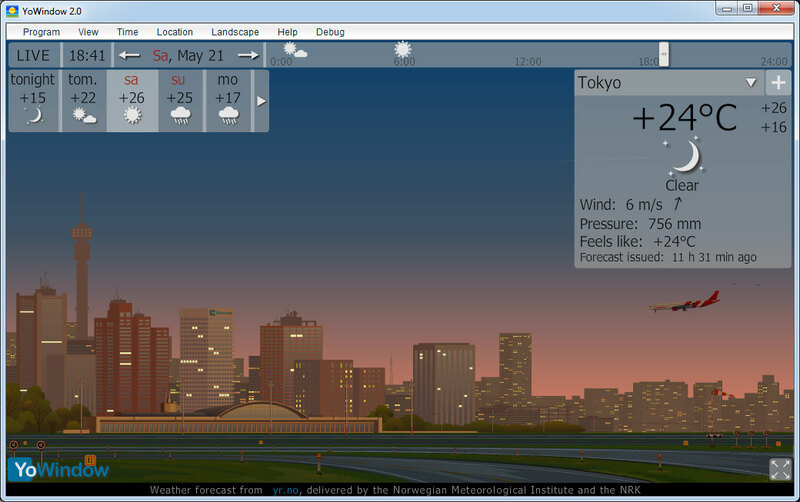 YoWindow takes the current weather from METAR stations network. There are around 4380 active METAR stations scattered around the world. Most of them are located in airports. YoWindow picks the closest METAR station to the location you choose. Then the current weather is loaded from this station. You can find METAR stations near your place on this site. In mobile editions of YoWindow you can also choose the following current weather providers. We want to express our unlimited gratitude to yr.no team for giving us the opportunity to use the top quality weather forecasts. Can I change the current weather station (METAR station) for my place? But how do I find the closest METAR stations to my place? YoWindow does not know when the seasons change at your place. But, it is trying hard to guess the correct picture. There are 5 seasonal pictures in YoWindow - winter, spring, summer, naked and autumn. YoWindow picks the picture according to the season-map for the place. However, there are some rules that override the season-map choice. When the temperature less or equal to -5°C (23°F), winter season displayed. When the temperature is more or equal to +5°C (41°F), YoWindow thinks that all the snow has melted and displays naked season instead of winter. Season-Map is a string describing the dates when the seasons change for a place on Earth. The format is simple - a sequence of [date:season] pairs, each pair shows when the season starts in average. YoWindow picture is changing according to season-map, however there are some exceptions. How does YoWindow choose the season? We have composed a collection of season-maps for many points on Earth. A season-map for selected location is taken from the closest point. 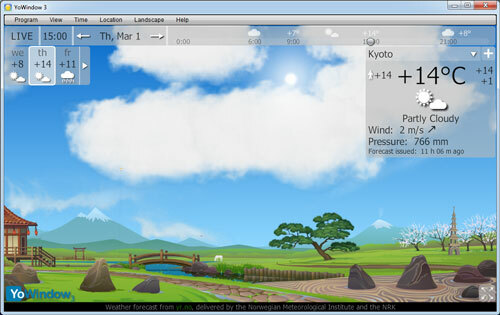 The season-maps are composed from historical weather reports and the feedback from YoWindow friends around the world. If you think the season-map for your place is completely wrong, you can correct it by submitting your season-map to our YoWindow season-map forum. Please submit the season-map ONLY if the difference between your and YoWindow season-maps is significant. How do I find the closest METAR stations to my place? Probably the best way to browse METAR stations is Google Earth. 1. Open Google Earth METAR layer right inside your browser. NOTE: You will be requested to install Google Earth plugin. Confirm the request. Just find your location and you will see the METAR stations scattered around. Click the one you like to find the ICAO code. When you find a weather station of your choice, click it to find the 4 letter ICAO code, like "KBKV"
You need to enter ICAO code inside YoWindow to start updating the current weather from the station. The advertising. There are no ads inside the paid version. Looks like you have installed YoWindow Weather onto external (SD) card. You need to move YoWindow to the main memory of the device. Android Live Wallpapers do not work properly if they are installed on external card. 1. Tap on the message - the "close" button will appear at the top right corner of the message. Tap the button and the message will be gone forever. 2. Add YoWindow widget to the desktop. The message will go away forever. You can remove the widget unless you want to keep it. Usually upgrading Flash Player helps. If it doesn't help, remove Flash Player and then install it again. However, it depends on a kind of landscape you are looking for. There are three types of YoWindow landscapes. 1. 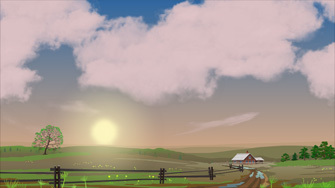 Animated landscape - YoLandscape. This is the most impressive kind of a landscape. The landscape changes along with the weather, season and sunlight. There are many living objects like smoke, grass, trees, animals and so on. There are 4 YoLandscapes available - Village, Seaside, Airport and Oriental. The work on new YoLandscapes is in progress. 2. YoWindow landscape made from a regular picture. This is a picture of Rome Colosseum we have found on Flickr. Now have a look at the same picture inside YoWindow. Scroll the time to experience different light and weather conditions. You can create a landscape like this yourself. From your own picture, taken with your camera. Follow our tutorial explaining how to turn a regular picture into YoWindow landscape. There are many live-sky landscapes created for YoWindow by our friendly community. The landscapes are made from real photos taken around the world. Browse through our Landscape Collection. You can open any picture or photo inside YoWindow. YoWindow will take care of the weather and sunlight. The picture will be covered by rain, snow or mist depending on the weather. It will fade-out in the night and fade-in on the sunrise. Make sure you have picked the right picture. YoWindow expects the picture to be taken on a sunny day. If you pick a night scene, it will look dark in the day and very dark in the night. Try to pick a picture taken when the Sun is shining. Picture width or height must not exceed 2880 pixels, otherwise YoWindow will not be able to display it. Click "Browse" button to locate a picture on your system. Installing a landscape is easy. 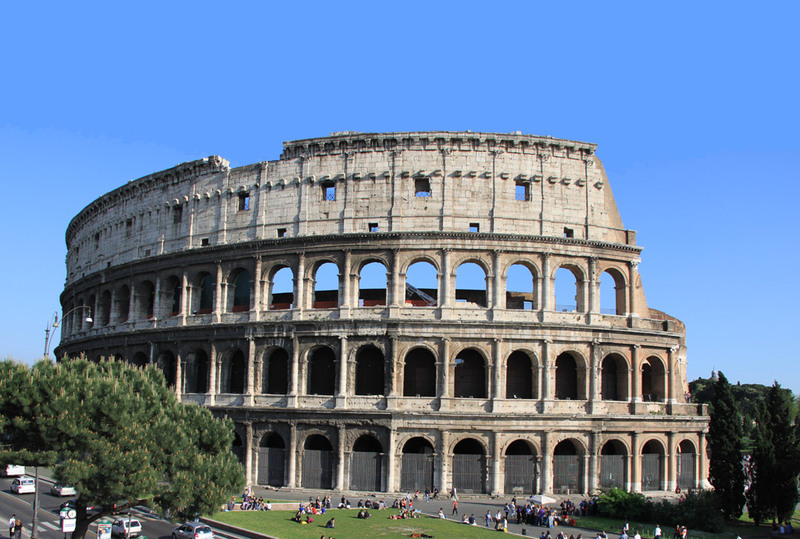 This is one of many posts in our Landscape Collection featuring Colosseum. 1. Find a link to colosseum.zip file at the bottom of the post. That's it, you should see Colosseum inside YoWindow. Browse our Landscape Collection for more landscapes. Follow our tutorial and turn a photo into your own YoWindow landscape. Where can I find FREE images? I want to contribute a Landscape to YoWindow Collection. The original picture for YoWindow Landscape must be licensed as FREE for commercial use and MODIFICATIONS or PUBLIC DOMAIN. Otherwise we can NOT include the Landscape in YoWindow. Where to find the copyright free images on the internet? We have found these sites for you: top websites with public domain images. And, of course, you may use your own pictures. Follow our Blogger Weather widget tutorial. Most likely a part of HTML code is garbled after the widget gets added to the blogspot.com. By some reason "amp;" text is getting added twice in flashvars parameter value. Remove amp; manually to resolve the problem. How can I connect YoWindow to my weather station? 1. Setup your weather station to export yowindow.xml - a file with current weather in a special YoWindow format. Choose your station model or weather software below and follow the step by step tutorial. If your station is not listed, see this question. As soon as you have propertly setup your weather station to export yowindow.xml, follow these steps. Join our forum and learn how to create YoWindow XML file for your station or ask our friendly community for help. Please Download the latest YoWindow and install it. YoWindow builds prior to 494 will not work with Flash Player 10.3.183.5 and later. YoWindow takes the weather from the Internet service, which in turn takes the weather from weather stations around the world. Usually, the weather is delivered to YoWindow in 10 - 40 minutes after the moment it was observed at the station. In a case when the delay exceeds 2 hours, the "Weather expired" warning is displayed. This is a signal that the weather in YoWindow may have nothing to do with the actual weather outside. If there's something wrong with the weather, YoWindow lets you know. There are several causes that may lead to "Weather expired" warning. 1. Weather station (METAR station) is not reliable. YoWindow takes the current weather from airport (METAR) weather stations. The most closest weather station to the location is picked. However, the weather station may not be a reliable one. For example, it may not provide the weather in the night or on the weekends. Or it may provide the weather in a very long intervals like 4 hours. We are constantly working on exclusion of the unreliable weather stations, but this still maybe the case. Alternatively, you may change the METAR weather station manually by entering ICAO airport code in Location Properties dialog. You may check if the weather station is reliable. There you will notice "METAR" section along with "Code:" line. There is a "www" link. Click "www" link and the page of the weather station will open. Find "Current weather observation" section. In the table, in the first line the age of the weather data displayed. Like "The report was made 29 minutes ago, at 04:50 UTC". If the age is greater than 2 hours, the weather station is not reliable. As you may know Internet is not 100% reliable. Sometimes a site does not open because of network problems for a certain period of time. YoWindow loads the weather over the Internet. And if the Internet does not work, YoWindow cannot load the weather. Wait a couple of hours, if the problem still exists, most likely this is not a networking problem. 3. YoWindow version on your system is too old. Make sure you have the latest YoWindow version installed. An old version may not load weather automatically on certain systems. YoWindow goes crazy if the computer time is different from the actual time by 15 minutes or more. Do not trust the time you see on the Windows clock. It may show you the right time, but if the time-zone is set wrong, the time is wrong! Follow these steps to make sure the computer time is set right. If you still keep getting "Weather Expired" warning, this must be a very special case on your system. That means YoWindow cannot connect to our server or the Internet. This may be a temporary problem due to network issues on our side. However, if you see this error all the time, most likely YoWindow is blocked by a Firewall software (usually Windows Firewall). Follow these steps to troubleshoot the problem. 1. Exit YoWindow. DO IT RIGHT: through main-menu/Program/Exit. Otherwise YoWindow may just close the window, but not to exit. 2. Turn your Firewall software temporary OFF. Check if you can choose a location this time. If YoWindow works properly - you can select the location - you need to grant an Internet access to YoWindow in your firewall software. Otherwise YoWindow will not be able to update the weather. 2. Check "Show small YoWindow logo" mark. There are no snow cover level information in the current weather (METAR) reports YoWindow receives. YoWindow it trying to guess if there is snow on the ground. A simple snow detection algorithm is used for this purpose. Unfortunately the algorithm does not work under some conditions. We hope to improve the snow coverage detection algorithm by the next winter. For the moment it is the way it is. Most likely YoWindow icon is hidden from the notification area (system tray). This is a common case on Windows 7. You need to allow YoWindow temperature icon to be displayed. This article explains how to fix this the problem on Windows 7. This article explains how to fix this the problem on Vista. On older Windows versions follow the same approach. I should say, if you have downloaded YoWindow from yowindow.com you can trust it. 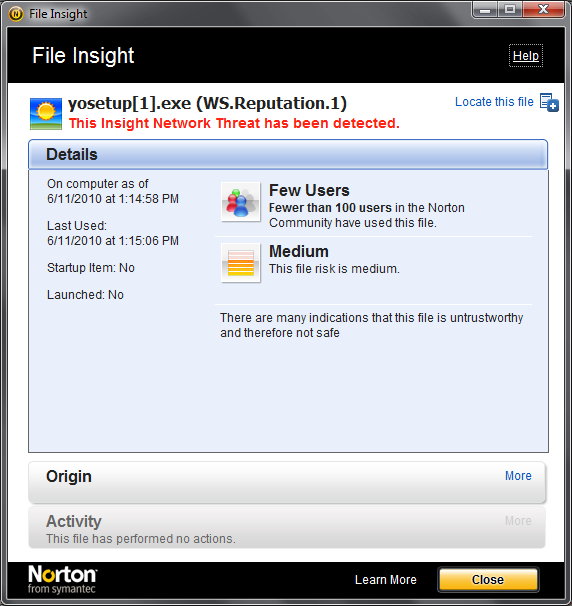 Norton Internet Security just gives you a warning that it does not know this file. Because YoWindow is updated so frequently, it is hard for Symantec to speed up to us. In a case Norton does not know anything about new program - new build of YoWindow in this case - it prefers to warn a user with a scary message. Just in case. Norton Internet Security is suspicious to a new build until 100 members of Norton Community to install it. This article on Norton Community site explains how to workaround the problem. YoWindow designed to automatically detect local time for any place in the world. And it does the job pretty good. However, a mistake is still possible since time-zone rules are changing over time by some countries. If a daylight time change occurs while YoWindow is running, YoWindow is not able to detect it. YoWindow will keep displaying the wrong time until you restart it. To restart YoWindow go to main-menu/Program/Exit. And then launch YoWindow again. But in most cases, the cause of this problem is the wrong time set on computer. Open Windows time settings. There you will find the time zone set on your computer, like this "(GMT-08:00) Pacific Time (US & Canada)". Make sure this is the right time zone for the place where you are now. There you may also find this option: "Automatically adjust clock for Daylight Saving Time". We recommend to set this option checked. Now adjust computer time if it does not match to the actual time at your place. Press OK to apply and exit time settings. If the computer time is set right, but YoWindow still displays the wrong time for your place, please Contact us, we will help. It seems that the default display scale factor is altered in your Windows settings. YoWindow can only operate properly when the display scale factor is 100%. When you change it to 125% or 200% YoWindow goes crazy. We have tried hard to fix this problem, but still cannot find a solution. You can check and modify display scale factor in the Control Panel display settings. And there "Change the size of all items" section. As a workaround, in YoWindow, press F11 to enter full-screen mode. In full-screen mode the bugs will go away. You will be able to interact with the buttons and the menu. © 2009 - 2019 РепкаСофт. Все права защищены.